In line with the title of the EASST 2014 Conference ‘Situating solidarities’, many conference presentations addressed the idea of ‘better together’ and multiple associated questions, including the ones related to the diversity of modes of togetherness, matters of inclusion and exclusion, and what is lost in not allowing ourselves to be together. One track ‘Synthesising the futures’ systematically analysed related shifts in the production of technoscientific knowledge and communities. In the multitude of changes in organization and processes of knowledge-making the track convenors and participants highlighted two: a move to large-scale programmatic research organization forms and an increasing emphasis on inter- and transdisciplinarity. In what follows I reflect on several kinds of effects, stimulated by these two moves, which were identified by participants of this and other tracks. Several papers demonstrated how in the transforming policy environments actors engage in work across disciplinary and professional boundaries, redefining their identities and formulating new ones. For instance, in their paper ‘On the emergence of Synthetic Biology as a techno-scientific field’ Benjamin Raimbault, Pierre-Benoit Joly and Jean-Philippe Cointet showed the centrality of a new breed of actors, ‘institutional entrepreneurs’, to the formation of the synthetic biology field. The authors described in detail how institutional entrepreneurs go beyond scientific community and participate in creating institutions that stabilize rules in the field; establish relations with industry through patents; and become involved in political and legal bodies through, for instance, membership in ethics committees and thematic reports. Through such extensive networking and interacting these actors support the formation of the synthetic biology field. At the same time in the paper ‘Exploring a sticky future: Understanding the (non) emergence of synthetic biology’ Susan Molyneux-Hodgson warned that being an entrepreneurial agent (or institutional entrepreneur) comes at a price. Reflecting on the assembling of the same synthetic biology field in the UK, she exposed how, while funding and infrastructure continue to grow, synthetic biology is ‘sticking’ as scientists engage in hyper-networking and economic imperatives come to ultimately guide the decision-making. Correspondingly, questions arise regarding whether scientists who increasingly work across boundaries and assume new identities still have time to do science, whether infrastructure and organization now come before practice, and what these could mean for our understanding of what science is? Furthermore, the paper pointed that it is difficult to grasp what kinds of futures are being made by a field that is yet to stabilize. This ambiguity is reflected in ever-changing expectations discourse, from synthetic biology being a turning point in the evolution of science, to it being a platform technology for other fields to being an emerging industry. The ensuing session discussion highlighted an ambivalence regarding whether synthetic biology ‘boundary actors’ have then resources and opportunities to actually engage in future-building and what a failure to do so could mean for the further emergence and maintenance of the field. Interestingly, Celso Gomes suggested in his paper ‘Synthesising communities: synthetic biology and (micro)biofuel production in the EU’ that simultaneously the reverse situation can be observed: a clearly envisioned future (low-carbon EU) and barely existent synthetic biology community to take up and realize this vision. In the example of synthetic biology field we see an uneasy and at times stumbling co-production of future visions and communities, with synthetic biology actors struggling to assemble the field and envision related futures, and wider socio-political environments continuously making futures and shaping knowledge-making communities to take up the produced visions. Some papers discussed transitions in building knowledge-producing communities, demonstrating their diffused nature and often disorderly inclusion and exclusion practices. Below I consider two examples that highlight how these features play out for two different kinds of technoscientific communities. One paper by Freeman Lan, Gordon Hoople and David Rolfe (‘Mapping the nanotechnology community and its responsibilities’) analysed formation and functioning of the nanotechnology community. As ‘nano’ is a technology facilitating work in other disciplines, the nanotechnology community is scattered across different disciplinary and organizational niches. The authors pointed out that nanotechnology researchers are very diverse and loosely interlinked, and there has been a lack of initiatives to integrate the community and to develop shared norms and goals. Such dispersed state of this technoscientific community, with everyone who have found ways ‘to understand, manipulate and/or create matter at the nanometer scale’ potentially being its member, raises multiple questions with no clear-cut answers. For instance, who and how should be responsible for agenda-setting and overall governance of the nano field? How to enable accountability? Who is to ‘own’ problems in case they arise? The paper ‘Future Earth: visions and practices of integration in global environmental change institutions, knowledge and communities’ by Eleanor Hadley Kershaw demonstrated that active work on community integration and governance building adds new questions to the ones already mentioned. Through analysing practices of the ‘Future Earth’, an international research initiative on environmental change that aims not only to bring together diverse range of disciplines but also to engage non-academic actors in research in line with the vision of post-academic science, the author showed how messy the work of defining andengaging the Future Earth community is. Who exactly to involve and how? Who decides? How can individual institutions and groups relate to grand visions of the Future Earth? Both examples suggest that knowledge-making communities emerging currently in the environment with much emphasis on programmatic large-scale research and broad engagement, are characterized by fluidity and absence of a straightforward membership criteria. They are faced with challenges of defining themselves, enabling members to relate to each other, finding ways to imagine futures together and, perhaps, rethinking what being a community could mean. Many papers stressed the still growing importance of the work of imagination and promise-making for the emergence of and developments within technoscientific fields and communities. The shifts in knowledge-making, that form the background of this reflection (a move to big programmatic science and emphasis on inter- and transdisciplinarity), have gained momentum with an increasing recognition of a close intertwinement of science and society. Images of sciences working in and with society have been absorbed in policies, research funding instruments and governance structures. Correspondingly, knowledge production has extended beyond the traditional spaces of science, and research is increasingly expected to be reflexive about societal futures that come along with its processes and results. Against this background Stefano Crabu in his paper ‘The emergence of translational nanomedicine: Expectations, scientific narrations and materiality’ demonstrated how a biomedical device under development is being constructed and presented as a ‘promissory bio-object’. Conceiving a technoscientific object as a ‘promissory’ one brings in a reflection on potential futures into the research process and allows scientists to actively work on managing expectations alongside the research. Furthermore, the paper reaffirmed that imaginaries of (better) futures and corresponding promises are becoming more and more important for attracting attention, support and resources for the establishment and development of fields, technologies and individual projects. Importantly, Thomas Völker in his paper ‘‚Futuring‘ in transdisciplinary sustainability research’ adds that in attempts to find new more inclusive and comprehensive modes of knowledge production and make them work, a diverse range of futures is being envisioned. Using the example of the proVISION programme, he demonstrated how in transdisciplinary research, involving collaborative research topic selection and formulation of questions, heterogeneous actors draw on distinct imaginaries of futures, which can lead to tensions in making choices. The paper conveyed the need to recognise the importance of contesting and negotiating futures in the transforming production of knowledge and communities, and support these processes through facilitating long-term connections between academic and non-academic actors, through thinking about what happens when research ends, and through allowing inclusive future-making with room for diverse visions. The types of recent changes in the production of knowledge and knowledge-making communities briefly discussed above are not meantto constitute an exhaustive list. Multiple other processes are unfolding alongside and interfering with the ones that I teased out from the rich material presented during the EASST 2014 conference. What many conference papers made apparent is that doing things together both holds great promises and raises enormous challenges, which we still know little about despite of several decades of analysis and reflection. 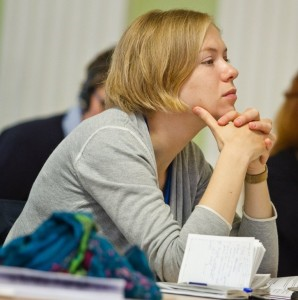 Olga Zvonareva is Research Fellow at the Department of Health, Ethics and Society, Maastricht University; and Research Fellow at the REC PAST-Centre, Tomsk State National Research University. Her research focuses on processes and dynamics of innovation in (bio)medicine.